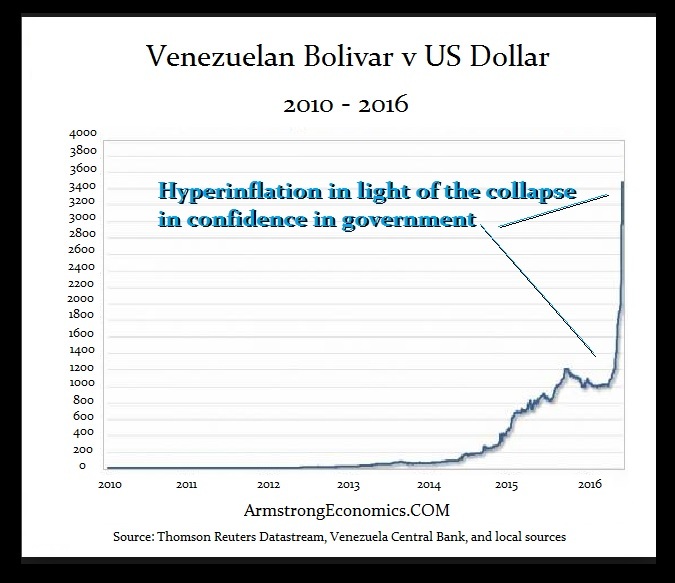 The Venezuelean hyperinflation is the direct result of what happens when the general population loses all confidence in the government. The current hyperinflation is reminiscent of Germany’s hyperinflation following World War I, which was also the result of a Communist Revolution and the overthrow of the government giving birth to the Weimar Republic. Venezuela’s currency has become virtually worthless as was the case in Japan when the people simply refused to accept any coins issued by the Japanese government. In that instance, each new emperor devalued the outstanding money supply to 10% of his new issues. This led to Japanese accepting Chinese coins, but not Japanese. In just two months, the bolivar plummeted 50% in value after dropping beneath the psychological 2000 level for the first time. Where the Japanese relied upon Chinese coins, in Venezuela they are using U.S. dollars. The same is starting to emerge in India after the government demonetized the large denomination notes. Oil accounts for nearly 95% of Venezuela’s exports and composes 25% of the country’s overall economy. Many economists are blaming Venezuela’s socialist government for mismanaging budgets and over relying on oil-related industries. Acting as a typical politician, President Maduro will not take responsibility for the state of his country and is choosing to place the blame on an “economic war” being waged by overseas businesses predominantly in the U.S.
Venezuela’s troubles began in 2014 when the price of oil took a nosedive. Instead of moving to separate the country from its dependence on oil, the Venezuelan government lost the confidence of the people and was compelled to issue more money to pay its bills lacking revenue flow. As the prices of goods continue to soar, shopkeepers in Venezuela have taken to weighing bolivars and the black market for alternative currencies – namely U.S. dollars — is becoming prevalent. The key to hyperinflation is NOT the issue of money, but the collapse in public confidence. The drop in confidence then causes the government to print more to meet its expenses. The assumption it is the increase in money supply assumes people blindly just look at the quantity of money. It is the fact people ANTICIPATE the collapse and act accordingly, which then causes the government to increase the money supply.